Nursing dogs face many of the same issues as nursing women when it comes to milk production and weaning their young. If her puppies are not weaned properly, a mother dog's mammary glands become painfully engorged. Though most of your focus may be on the puppies, you must make time to care for the mother dog to keep her healthy. Start to wean the puppies three to four weeks after birth. This is a gradual process that lasts until the puppies are eight weeks old. Gradual weaning helps the mother slowly reduce milk production. Introduce solids to the puppies so that they drink less milk. Gradually increase the amount of solid food provided to the puppies, until it is their sole source of nourishment at eight weeks of age. The mother's milk production lessens over the course of the weaning period. Adjust the mother's food intake as the puppies eat more solids. Nursing mothers need more calories to produce milk. As the puppies' milk need subsides, the mother requires less food. Reducing calorie intake helps a dog's milk dry up. 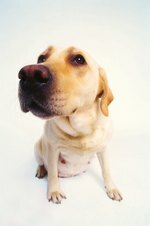 Help ease the mother dog's discomfort if her mammary glands become engorged. If this happens, place a hot towel on the glands and gently massage them. Removing food and water for one day may help. If the mother keeps producing milk after the puppies have completely weaned, take her to a veterinarian.